EDITOR'S NOTE 11/21/2017: The new Climate Watch platform is now available, allowing you to explore historical and projected emissions, countries' climate targets and their linkages with the Sustainable Development Goals. Our ability to harness ever-expanding amounts of data is completely transforming our understanding of environmental problems and solutions. Our Climate Insights blog series leverages data from CAIT 2.0, WRI’s climate data explorer, to shed light on the many dimensions of climate change that shape society, policy, and global development. All eyes are on Lima, Peru, where country representatives will gather next week for the annual U.N. climate negotiations (COP 20). One question is at the heart of these negotiations: How can countries reduce emissions enough to collectively limit global temperature rise to 2 degrees C, thus preventing the worst impacts of climate change? In Lima and over the next several months, countries are expected to put forward new national emissions-reduction pledges for achieving this target in the decades to come. WRI’s recently published the CAIT Equity Explorer can help assess the equitability of these pledges. 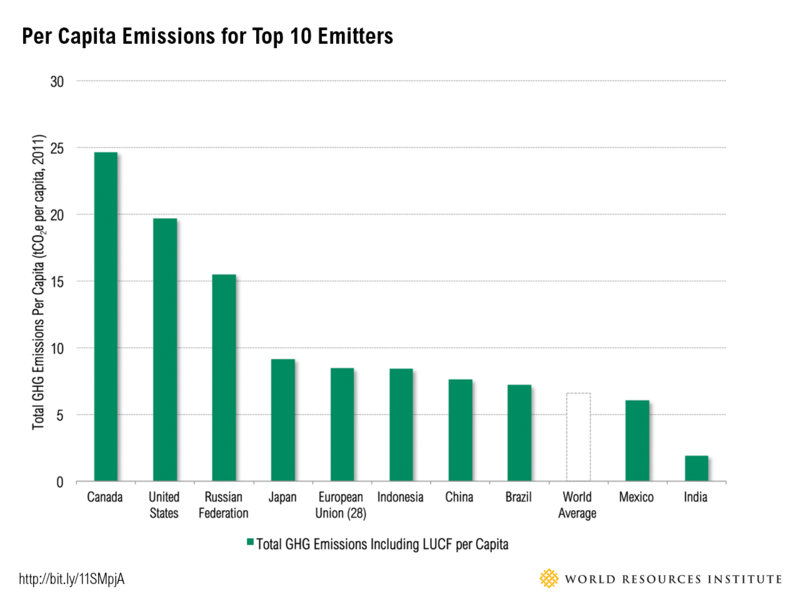 While equity considerations include more than just emissions—and all countries must take action to mitigate climate change—the actions of the world’s top emitters will likely be most heavily scrutinized—and rightly so: According to recent data, 10 countries produce around 70 percent of global GHG emissions. 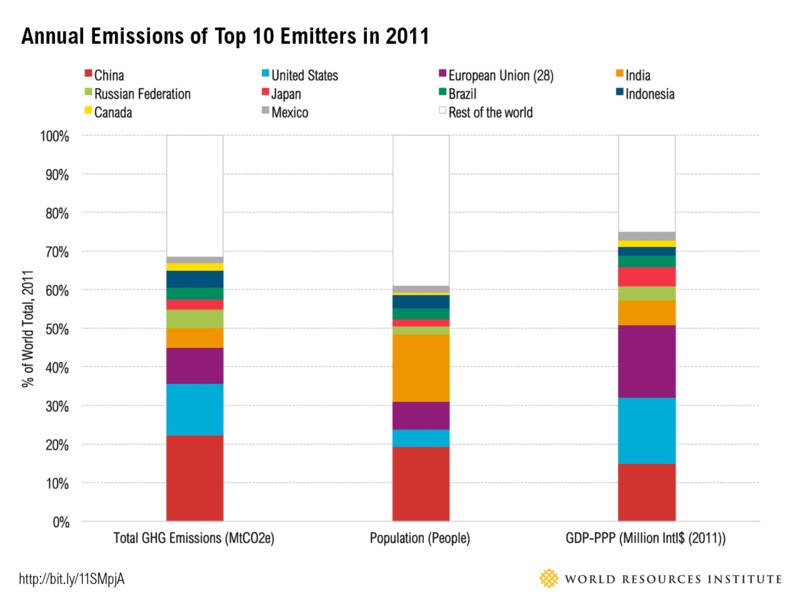 Here’s a deeper look at these top 10 emitters—examining their total emissions, per capita emissions, emissions intensity, and historical cumulative emissions—based on data from WRI’s Climate Analysis Indicators Tool (CAIT 2.0). 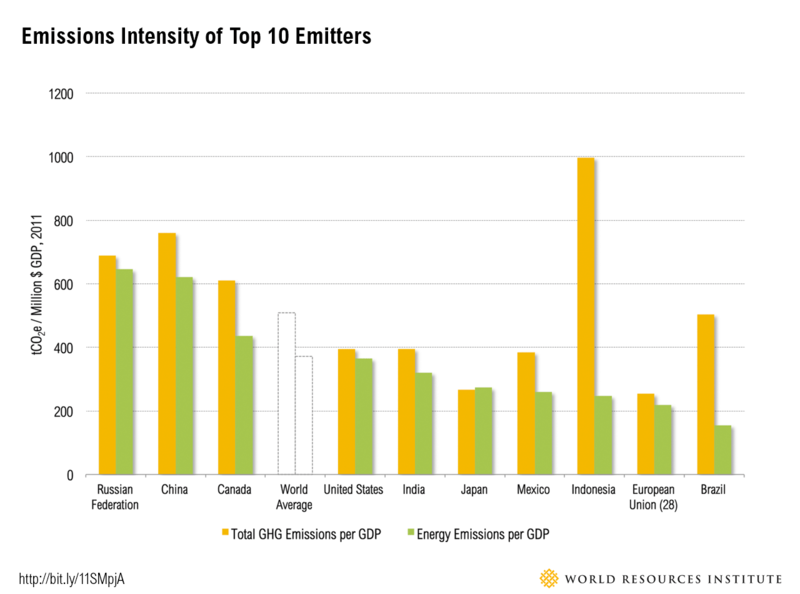 While many countries focus their de-carbonization plans on energy-related emissions, high emissions intensity could actually result from emissions from other sectors. 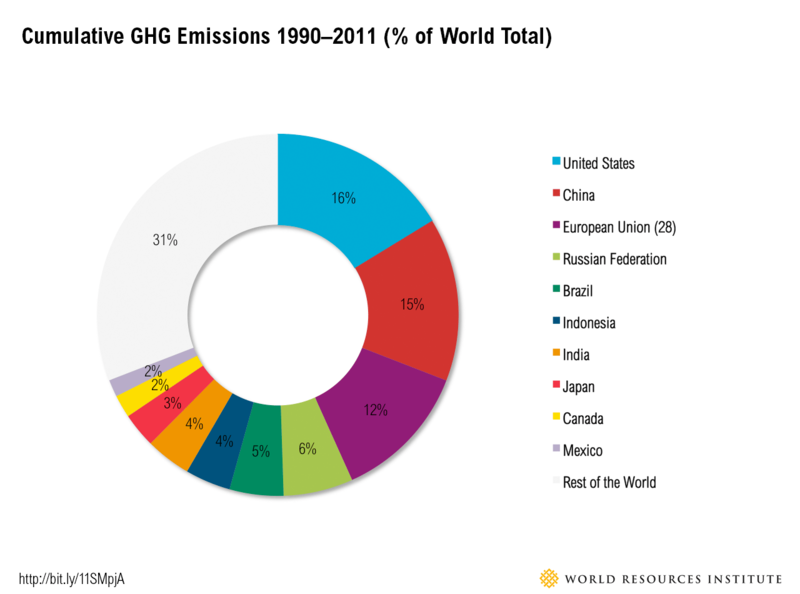 For example, with emissions from deforestation and land-use change taken into account, Indonesia becomes the most intensive emitter. 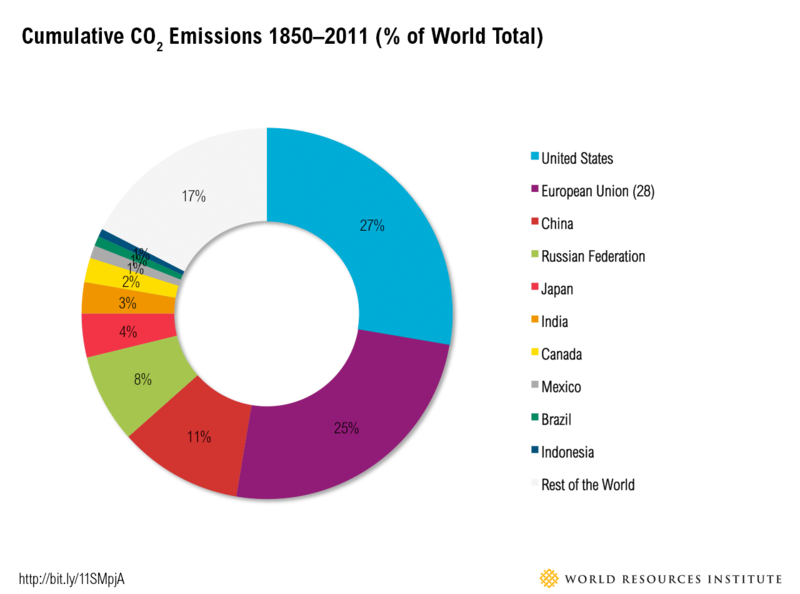 The graph below expands the time period from 1850 to 2011, during which data only on CO2 emissions are continuously available. 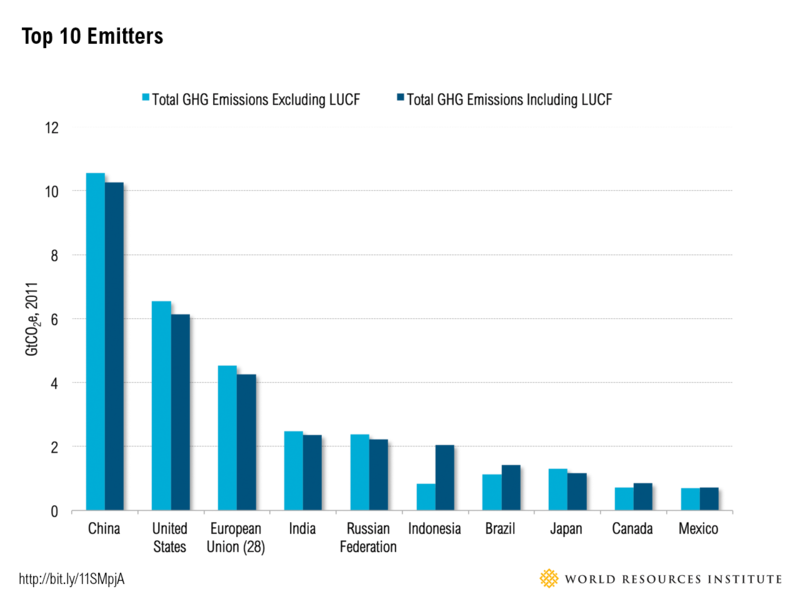 In this case, the five major emitters—the United States, European Union, China, Russian Federation, and Japan— together contributed two-thirds of the world’s historic CO2 emissions - using up around 37 percent of our global carbon budget.